Hundreds of workers were occupying Ireland’s world-famous Waterford Crystal factory tonight after being told by text message they were losing their jobs. The relatives of those killed by British forces in the north of Ireland have criticised the emphasis placed on so-called “recognition payments” to be paid by the British government to their families as a way of dealing with the past conflict. Plans for a new international sports stadium at the site of the former prison at Long Kesh were finally axed yesterday. Deputy First Minister Martin McGuinness has hit out at the Dublin government for describing cross-border shoppers as “unpatriotic”. The PSNI police mounted raids in Ardoyne on Tuesday against an anti-drugs group which they say is linked to republican militants. eirigi spokesperson Breandan Mac Cionnaith has called for the immediate release of Belfast republican Terry McCafferty, who is currently languishing in a prison in the North. This year’s Bloody Sunday Commemorative March in Derry will stop in William Street - where the original march was stopped on its way to the Guildhall before it was fired upon by British soldiers, killing 14 civilians. 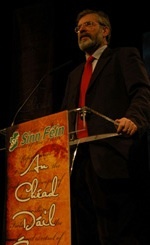 The keynote address by Sinn Sinn Féin President Gerry Adams at the Mansion House in Dublin to his party’s 90th anniversary commemoration of the First Dail. Can an incident-packed and prolonged time span be adequately explored in the form of a play? There were angry clashes in Belfast today before the publication of an official report for the British government on dealing with issues of truth and reconciliation in the North. On a visit to Washington DC to attend the US Presidential inauguration ceremenonies, Sinn Féin President Gerry Adams has said he believes that President Obama can assist the Irish peace process. Former RUC police chief Ronnie Flanagan has denied any knowledge of Special Branch surveillance of prominent human rights lawyer Rosemary Nelson prior to her assassination in 1999. Dundalk man Liam Campbell is the subject of an attempt to extradite him to Lithuania following his arrest this week. The Green Party is facing a mounting internal revolt over its participation with Fianna Fail in the crisis-hit Dublin coalition government. A victims’ campaigner has said he will sue PSNI Chief Hugh Orde after his personal details were passed on to unionist paramilitaries by a computer operator who was working for the PSNI. A claim that the IRA executed a South Armagh man for working as an informer in 1979 has been denied by local MP, Sinn Féin’s Conor Murphy. Caoimhghin O Caolain TD told the official commemoration this week that the work of the First Dail remains unfinished. We publish the full text of his address. Those who paraded themselves in the Mansion House on Tuesday past have little right to claim the inheritance of the revolutionary republicans and socialists who established the First Dail. Sinn Féin President Gerry Adams has accused republican hardliners of demanding protection money from drug dealers and other criminals in the North. The Dublin government has been forced to nationalise Anglo-Irish Bank because of a scandal over concealed debt and the serious erosion of confidence in the bank as a result, Taoiseach Brian Cowen admitted today [Friday]. Thousands have demonstrated in Ireland against the continuing Israeli invasion of Gaza amid mounting calls for the Israeli ambassador to be expelled and economic sanctions against Israel. PSNI chief Hugh Orde is to be asked to provide the information which led to Danny Morrison’s conviction for kidnapping being quashed. Sinn Féin have announced plans to commemorate the 90th anniversary of the first Irish parliament. 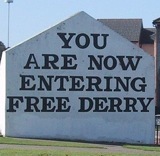 The famous ‘Free Derry’ wall was painted forty years ago this month. Eamon McCann corrects the record of the day when the inspiring international landmark was born. In the face of this economic crisis the argument for stronger not weaker government intervention in the economy needs to be heard. The Israeli bombing of two UN-run schools filled with children taking shelter from the continuing bloodshed in Gaza has provoked protests and increasingly desperate appeals for a halt to the killing. Pat Doherty is to stand down as Sinn Féin Vice President after over twenty years in that office. An Omagh teenager has recorded on his mobile phone an attempt by the PSNI police to persuade him to become an informer. The DUP has interpreted comments by Gerry Adams as an admission that the hope of a united Ireland by 2016 has been abandoned. After a decade of delays and deliberate procrastination, public hearings in the inquiry into the 1997 murder of Robert Hamill are to begin in Belfast next Tuesday. 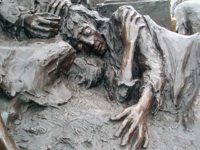 Ireland is to officially recognise the Great Hunger - more than 160 years after British colonial policies coupled with the collapse of the critical potato harvest resulted in the death or emigration of some two million people. The People’s Democracy march, forty years ago this week, is seen by historians as marking a significant turning point in the recent conflict. The reoccupation by Israel of the Gaza Strip and the slaughter of its Palestinian inhabitants form one of the most shameful episodes, among a long list of others, for the international community since the state of Israel was set up in 1948. The Dublin government and all of the political parties in the 26 Counties have condemned Israel’s invasion of Gaza and have backed calls for a ceasefire in the region. Previously confidential files released this week in Dublin, Belfast and London under the 30 year ruled provide evidence of the increasing role of the ‘Dirty War’ -- the use of covert intelligence and the SAS shoot-to-kill strategy by the British government. The summary imprisonment of Belfast man Terry McCafferty on the eve of Christmas is being viewed by republican activists as a vindictive reprisal for the release of the ‘Derry 4’, whose trial collapsed in Dublin just days before. 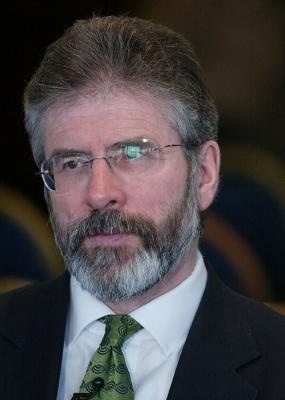 Campaigns to lobby for a united Ireland could tap into the huge Irish populations living in the US and in Britain, Sinn Féin President Gerry Adams has said. A bomb discovered on Christmas Eve close to an Armagh Gaelic club could have been picked up by children who regularly use the area. The President of Republican Sinn Féin, Ruairi O Bradaigh, has rejected a claim that the IRA sought peace talks with the British government in early 1978. 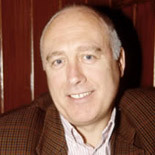 Independent TD Tony Gregory died today [Friday] at the age of 61 after a long illness. The full text of the New Year statements issued by Sinn Fein's Gerry Adams and republican organisations in Ireland. It is the contribution of the hunger strikers which will endure and make the difference to peace, justice and freedom - not that offered up by Cruise O’Brien.